…We’re going to look at how ‘Cutch’ (5’10” 190 lbs*) used Science to beat Paul Goldschmidt (6’3″, 245 lbs*) for the 2013 NL MVP. McCutchen has to stay close to human movement science in order to compete with big guys like Goldschmidt. Look at how to work on this at home. For a different angle on this, CLICK HERE to watch the – 1 min, 58 second – PBS Circus Physics video about the Conservation of Linear Momentum (aka, the Un-Weighting Principal). I get tired of hearing about instructors pushing the wider [non-athletic] stance. This makes it difficult to create any forward movement in the swing, and see it’s benefits (read below). I ask my students…what position – with your feet – would you want to cover a fast wide receiver? How about guarding an agile soccer striker? Or jumping to slam dunk a basketball? 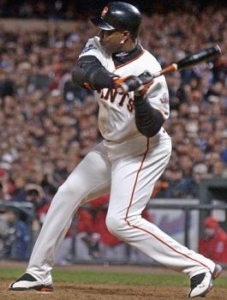 Hitters need to start from an athletic stance – feet slightly wider than shoulder width. “Sitting back” isn’t very effective when it comes to dynamic human movements. How Does Andrew McCutchen Do This? 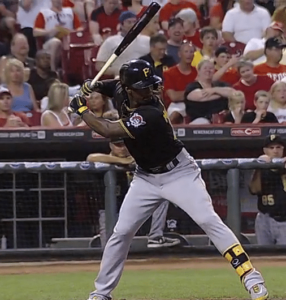 CLICK HERE to watch Part-2, Andrew McCutchen: Do This For Longer Drives. We’ll look at how effective Cutch’s Final Turn is…or isn’t. Most young hitters get the #1 long ball secret wrong (and how to correct it). A few weeks ago I worked with a 12-U Little League team from Bakersfield California called the Sliders. They recently came to Fresno for a tournament and DOMINATED. The three young men who hit their first home-runs had worked with me for the first time, a week before the tournament. Now, this wasn’t all me, but wasn’t a coincidence either. Before I worked with them, all three boys naturally had a little forward momentum working for them. And, Sliders Coach Justin Karr has been working the baseball hitting tips system with his team for over a year now. In the baseball hitting tips video, Barry Bonds gets on plane with the pitch very well by lowering his body. He does this by creating an “L” with his back leg to and through contact. Whereas the moment Alex’s front heel hits the ground, he ‘stands up’ causing ball flight to be low. Alex would have to get “on-plane” with his hands, which is very inconsistent. Have hitter loop band under armpits. You’ll see Olympic Hammer Throwers lower their backside as well. This enables the release of the hammer at an optimal forty-five degree angle. CLICK HERE to watch a World Record holding Hammer Thrower lower his backside while rotating. 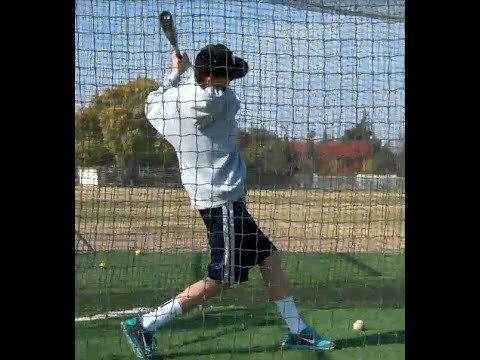 Softball Hitting Tips Video: Bat Speed Killer! These softball hitting tips work for baseball too. 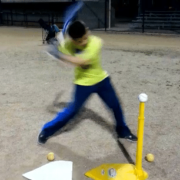 …Two-week swing period from one of my ten-year-old baseball hitters, Mikey. It doesn’t matter whether we talk baseball or softball hitting tips, it’s human movement principles we should be concerned with. It’s just amazing how one small change can have such a profound effect on bat speed. 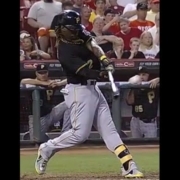 ARM Barring Bad: when it happens up to the Fight Position and/or during bat lag or drag. ARM Barring Okay: when we get to contact. You see Big Leaguers do this when they’re adjusting to reach pitches lower in the zone or towards the outside part. 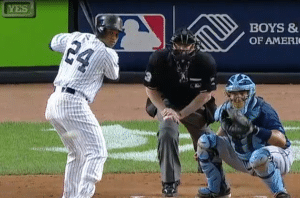 Please realize that a hitter swinging with an early arm bar will cause them to rotate slower, leaving them susceptible to fastballs up or inside the strike zone. I’m not talking about the shape of the front arm at impact, which if straighter will increase Ball Exit Speed. I teach my hitters to start bent, then let the pitch location dictate whether that front arm gets to bent or not at impact. See, hitters don’t know what pitch type, speed, or location beforehand. So our softball or baseball swing must build in that margin for error. Break the swing apart into two steps: 1) To the Fight Position (Landing), 2) Go into the Final Turn. 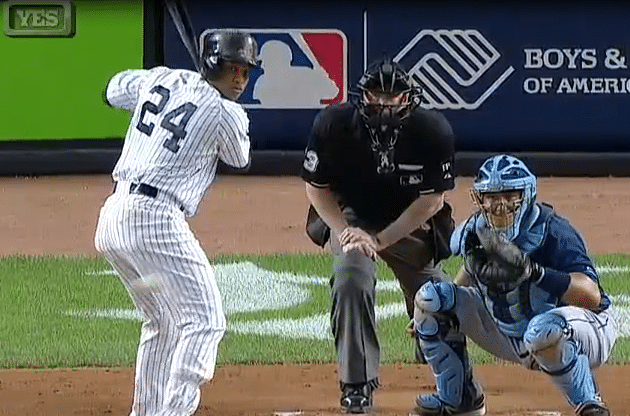 NO extra movement with the hands going back is allowed before hitter proceeds to step-two above. Once they get to the Fight Position, tell the hitter to move the upper body as “one piece” to get into the Final Turn. CLICK HERE for short video on Conserving Angular Momentum from the Public Broadcasting Station (PBS) on Circus Physics. 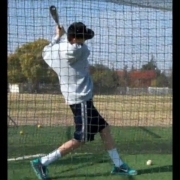 https://hittingperformancelab.com/wp-content/uploads/2014/01/softball-hitting-tips-video-faster-turn.png 405 306 Joey Myers https://hittingperformancelab.com/wp-content/uploads/2018/05/hitting-performance-labs_c90c0362088ef1d3d528f3078f4f8ac1.png Joey Myers2014-01-29 23:50:082018-11-22 21:22:53Softball Hitting Tips Video: Bat Speed Killer! How Far Should the FREE-FALL be? (setting up your feedback markers). Someone did a video analyzing The Babe’s swing (not up anymore), and what’s amazing is his nearly three-foot long bat almost matches his just under three-in-a-half foot stride length. Also important to note is Babe Ruth’s head moved two-and-a-quarter feet forward before his front heel hit the ground. CLICK HERE to see game footage. What do you think The Babe would say to those today who shout, “NO head movement!”? When we look at the science and its application, we know this statement doesn’t make sense. 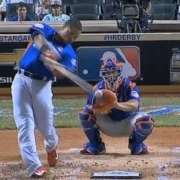 Watch how Davis is a big guy abiding by the rules in this baseball hitting video easy distance. 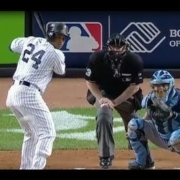 I hope you learned something from watching the baseball hitting video easy distance part two. 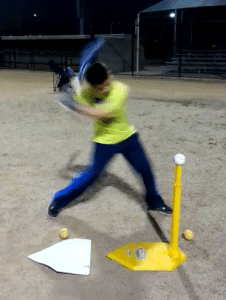 CLICK HERE for the Baseball Hitting Video PART-THREE (How-To Make Swing Science Sticky) of a FOUR-Part Series on Explosive Rotational Power. 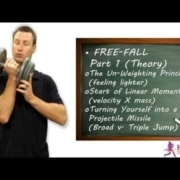 Turning Yourself into a Projectile Missile (Broad v. Triple Jump). It’s amazing what happens when you add a little momentum. Muscles don’t have to work as hard, and the body moves effortlessly through space. We get a “head start” using our body’s weight more than we realize…to get up from the floor, the couch or chair, or to step up into the bed of a truck. 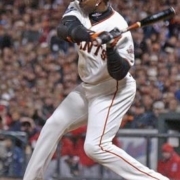 Why should hitting be any different…heck, just about every good player uses momentum in some way. I hope you enjoy Baseball Hitting Video Gain Distance PART-One. CLICK HERE to watch a YouTube video on how Babe Ruth gains distance the easy way. 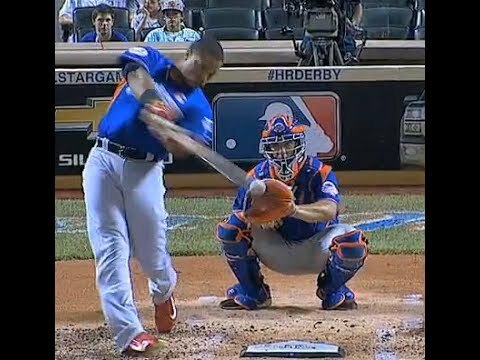 CLICK HERE for Baseball Hitting Video PART-2, where we go over how to apply what we learned in this video.